As per SCHSIA Bylaws, the Northwest Director and North Central Director will not come up for election until 2017. The secretary of SCHSIA will accept nominations for any of these positions mentioned above by petition with a written acceptance of the candidate from any member in good standing. Also nominations will be accepted at the Annual Membership Meeting in Oklahoma this October with acceptance by the candidate nominated. If there are no further nominations than those presented by the Board, these candidates will be automatically elected as per SCHSIA Bylaws. Note: Please be sure to register if you plan to attend the annual meeting so we can get a count of the attendees. SCHSIA Vice President, Jason Pelzel, is heading a committee to plan the 2015 annual meeting. The meeting will be held at Langston University on Friday and Saturday, October 16th and 17th. The Friday educational sessions will be followed by the annual business meeting on Sat. at a hotel TBD in Oklahoma City, OK. Langston is located about 40 minutes drive North of Oklahoma City. Further details will be forthcoming over the next couple months, so stay tuned and check our web site. Please see the attached announcement confirming election of Officers and Directors for this year. Our association is up to 75 members and growing rapidly. Please visit our web site www.stcroixhairsheep.org for an updated list of members as well as other timely information about what is happening in YOUR association. The new board would appreciate member input regarding your primary areas of concern for this year. So, if you would like to comment please reply to this email. This letter is to bring you up to date with what has been happening within the St. Croix Hair Sheep International Association ( SCHSIA) the past few months. First, the original corporation established in 1983 in Arkansas ( St. Croix Sheep Breeders Association ), has been merged into SCHSIA of Oregon. All assets of the original association are now legally transferred to SCHSIA. We are now fully established in business. Second, we have signed a contract with Associated Registries in Milo, Iowa and sheep can easily be registered or transferred as long as they conform to the original breed standards, white without color or visible scurs, and dues are current. Anyone paying dues after August 31st, 2013 to SCHSIA are paid through 2014. It has been necessary to start rebuilding our data base for our registry. St. Croix Hair Sheep Breeders, Inc. took over the data base and changed the breed standards without membership approval , and have taken the position of not sharing that data base, even though it originally belonged to SCHSIA. They will not release it without a court order. Even though a court order is attainable, the legal costs to do so are considered prohibitive The data base is being reconstituted by sending copies of father and mother pedigrees for all new registrations. Within a year to eighteen months the data base for our registry should be fully restored. As this letter is being sent, by-laws for SCHSIA are being updated and a draft of those updates will be emailed to each member for approval . The original seven members who reinstated SCHSIA have worked very hard but it is time for the membership to select and elect officers and directors for the coming year . 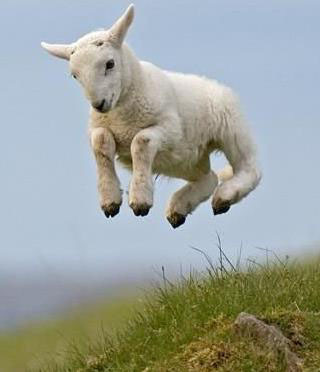 Please email any potential candidates to secretary@stcroixhairsheep.org, Edward Barnes, acting secretary, so that a slate of candidates can be formulated, and voted on by the membership. Your comments and suggestions are also welcome. Work is continuing on our Website (www.stcroixhairsheep.org). We will be adding many features in the next year. In the future , we will be able to add pedigree information for each registered sheep as well as on line registration, and our data base will be totally controlled by SCHSIA. We have placed a listing in the Breeders Directory of American Sheep Industry News, (monthly) and will be forwarding inquiries to our members. The important thing to remember is that SCHSIA is totally dedicated to its membership. They run it and they control it. Again, we wish all St. Croix Breeders the happiest of holiday seasons and we look forward to 2014. 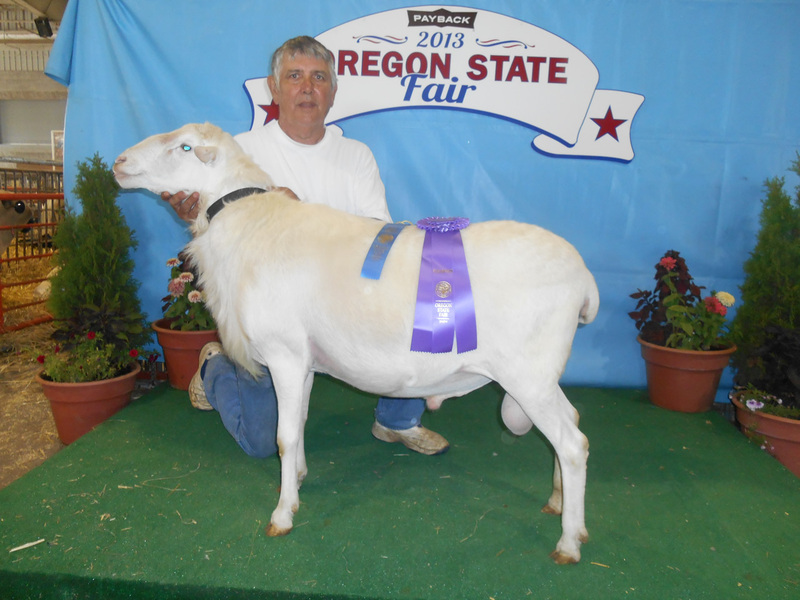 Nine different farm breeders displayed their animals at the 17th Annual St. Croix Open Sheep Show at the Oregon State Fair on August 22nd . Top honors went to the Dorsey-Lee St. Croix Farm as the premier breeder. 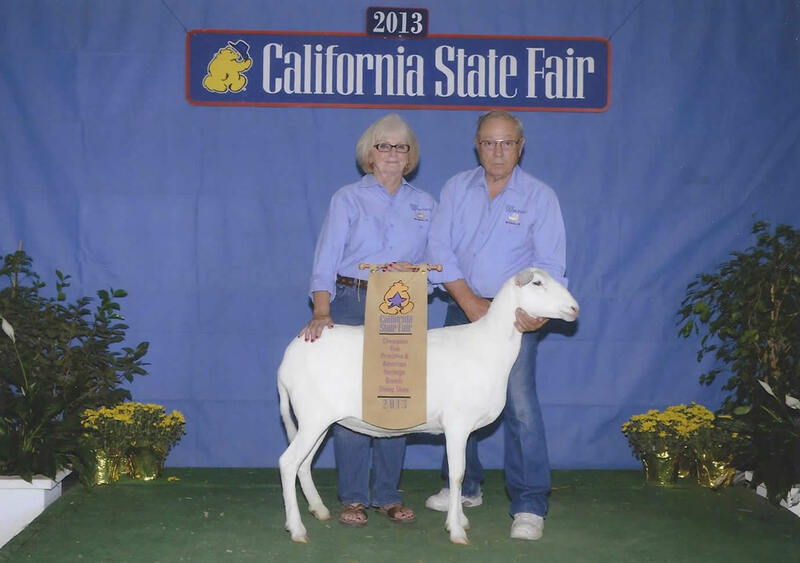 Ed and Linda Barnes of Dorsey-Lee Farm also won Grand Champion Ram, Reserve Champion Ewe, and best pair trophy. 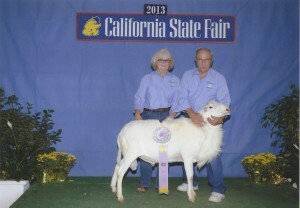 The Swan Ranch with Steve and Bill Swan took the Grand Champion Ewe award and trophy. Pink Ladies Ranch took the Reserve Champion Ram award. 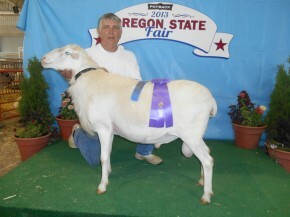 Oregon bred Get-of-Sire went to Vicki and John Hamstreet of Dreamfield St. Croix. Ribbons seemed to be fairly evenly distributed among the exhibitors. Karl and Jan Hyde of Lazy Shepherd Ranch showed some of their young stock as did Pam Bradley and Janet Ritz of Rainbow Harvest Farm. 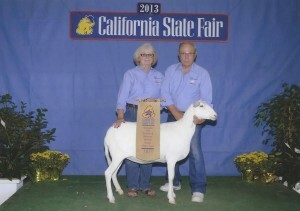 Sue Swan of Pink Ladies Ranch carried on the family tradition of presenting exceptional ewe stock. Chrystie Crawford and her son Eli took several awards and Eli won the first Annual St. Croix Junior Showmanship class and $35.00 first prize. There were approximately 12 young exhibitors in this class. 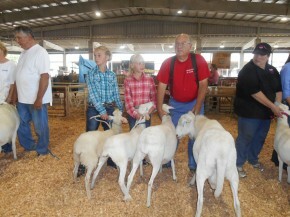 This showmanship class was the first step toward a Junior St. Croix Sheep show. There were five winning places with a total in prize money of $100.00, sponsored by Dorsey-Lee Farm and Lazy Shepherd Ranch. Mindy and Samantha Fenwrick of JMS Farm also had a good show with their young stock. Vicki and John Hamstreet accepted the prestigious OSF Herdsmenship Award Banner on behalf of The St. Croix Hair Sheep International Association member breeders. All nine breeders are currently members of SCHSIA. 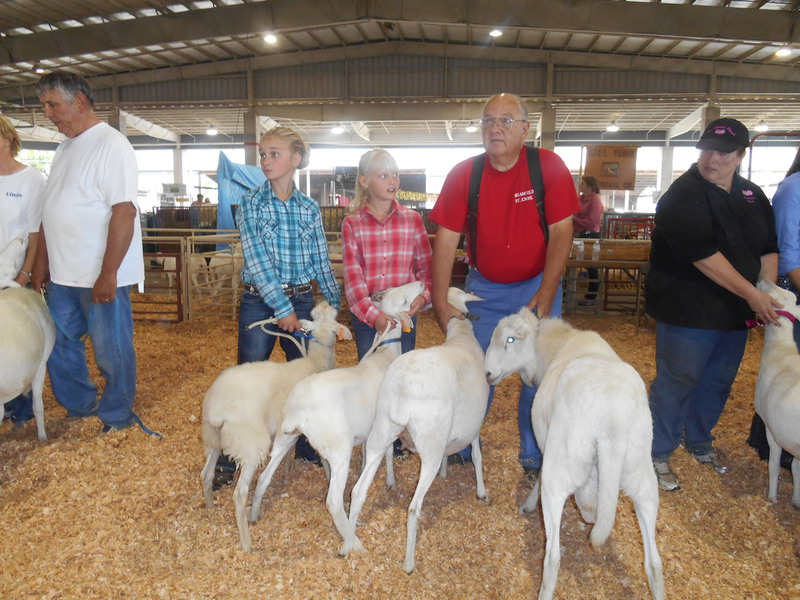 This award is given each year to the breed that displays the most friendliness to fair patrons, and keeps their spaces, sheep pens clean and promotional materials available at all times to fair goers. 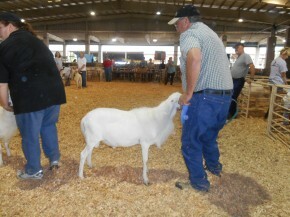 This was just one more year of success for St. Croix Hair Sheep. Bill and Marilyn Wire entered six St Croix rams and eight St Croix ewes in the Primitive and American Heritage Breeds sheep show July 27, 2013. Wire ranch received the Premier Breeders award. One ewe took Grand Champion honors and their ram received Reserve Champion. This went along with seven 1st place, four 2nd place and four 3rd place awards.